SEOUL, Feb. 11 (Yonhap) -- Historic sites associated with the March 1 Independence Movement are gaining extra relevance this year with the 100th anniversary of the 1919 popular movement that protested for independence from Japan's colonial rule of the Korean Peninsula. Across the country are various sites that commemorate citizens' efforts to achieve freedom. More than 10 percent of the Korean population, or about 2 million protesters, took part in the series of anti-Japan rallies that lasted from March 1, two days ahead of a funeral for Emperor Gojong of the Korean Empire, through May of that year. During the three-month period, about 1,500 rallies took place nationwide and Japan's ensuing brutal crackdowns on the rallies resulted in the deaths of 7,509 Koreans and 15,961 others injured, according to historical records. The independence movement, featured by the reading of a proclamation of independence from the Japanese colonial rule, spread like a prairie fire nationwide. Drawn up by writer Choe Nam-son and poet Han Yong-un, the proclamation helped rally Koreans to the cause of resisting the colonial government. Korea was under the Japanese colonial rule for 1910-45. The following are historic sites of the independence movement, where Korean protesters made preparations or recited the manifesto. 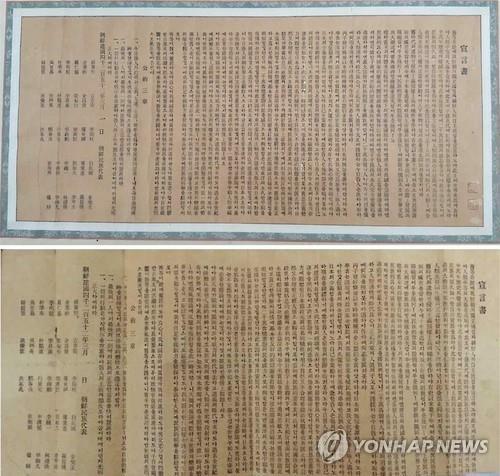 In the hours of 5 to 11 p.m. on Feb. 27, 1919, 21,000 fliers featuring the proclamation were printed at the Boseong printing office, which used to be near Jogye Temple in the capital. The printing house was founded by Lee Yong-ik, a close aide to the emperor, before being owned by the Chondogyo religious group. Around 2:00 p.m. on March 1, 1919, 29 of the 33 national leaders of the movement convened at Taehwagwan Restaurant, a upper-class dining place that was operated in the Japanese colonial capital's Insadong area, and held a ceremony marking the declaration of independence and the Korean yearning for freedom from the colonization. The movement's leaders had planned to hold the ceremony at the park in central Seoul but changed the venue to the restaurant without informing people about the change. A throng of 1,000 citizens and students formed at the park. Thirty minutes after the restaurant ceremony, Kim Ki-deok, the leader of the student protesters, brought a copy of the proclamation from the restaurant to the park and read it aloud, setting off a large demonstration that came with shouting the slogan of "Daehan dongnip manse," which means, "Long Live Korean independence," and raising the Korean flag. By nightfall on that day, thousands of protesters, including those who were in the capital to mourn the death of Emperor Gojong, dispersed. But many of them brought copies of the manifesto to their hometowns later, sparking massive demonstrations across the peninsula. A 16-year-old girl, named Yu Gwan-sun, played a pivotal role in leading a pro-independence rally at Aunae, a market in the town of Cheonan, south of Seoul, on April 1, 1919. A student at Ewha Hakdang in Seoul, established by American missionaries as the first modern educational institution for women in Korea, Yu joined one of the earliest demonstrations near Namdaemun, a gate in central Seoul. 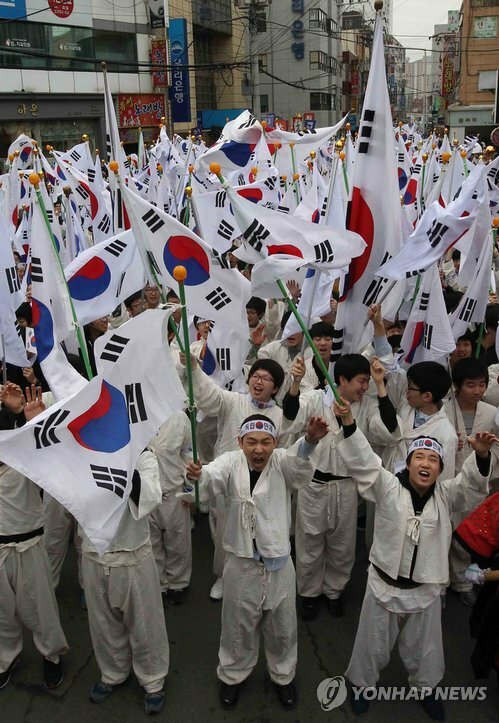 In the marketplace rally, 1,300 people gathered to demand Korean independence. The Japanese military police arrived and fired on the crowd, killing 19 people and injuring 30 others. Many protestors, including Yu, were arrested on charges of sedition. The first private middle school for Koreans, founded by missionaries from South Presbyterian Church in the United States in February 1903 and closed in 1940, was in Gunsan, a city in what became South Korea's southwestern province of North Jeolla, saw the first independence rally south of Seoul. A total of 30,000 students and Christians rose up against the colonial government at the school on 28 occasions on March 5. The Japanese police squashed the demonstrations, leaving 53 people dead and 72 others missing. In 2018, the Gunsan municipal government completed the construction of a memorial that replicates the school in memory of the peaceful movement for independence. On March 28 and April 3, Byun Sang-tae, an activist who had participated in the Seoul demonstration, led anti-Japanese rallies with a group of protesters from the three towns of Jindong, Jinbuk and Jinjeon in what is now in the southeastern city of Changwon. About 3,000 people confronted the Japanese military police before eight people were killed and 22 others injured. A monument to the eight who died was erected at the scene of the movement in the city in 1963. The anti-Japanese movement on Jeju reached its peak on March 21, when activist Kim Jang-whan brought the proclamation to the island after attending the Seoul rallies and organized four days of massive protest rallies along with his uncle, Kim Shi-beom, in the town of Jocheon. The protesters marched up Mimit Hill in the town, with Kim holding up a banner written in his own blood, which read "Daehan dongnip manse," and the Korean flag, in the vanguard of the rally. The church in Cheorwon, near the central section of the inter-Korean border, designated as modern cultural heritage No. 23, was another site where an independence movement took place. The church's young people, led by pastor Pak Yeon-seo, staged anti-Japanese rallies on March 10, 11 and 18. Released from prison in August 1919, Park spearheaded the Cheorwon Patriotic Group, a body aimed at reporting the status of pro-independence activities on the peninsula to the Korean provisional government in the Chinese city of Shanghai, before being jailed again the next year. 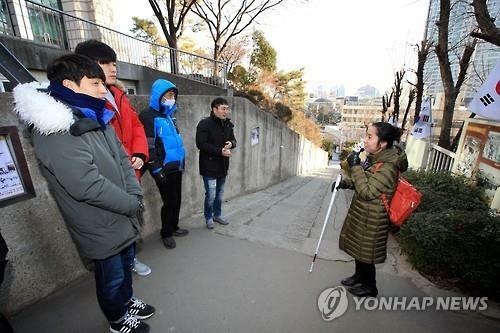 On March 8, students of Kyeseong and Shinmyeong schools in the southeastern city of Daegu, who wished to participate in the nationwide demonstrations, took an uphill road with 90 stairs in the city. The Uphill Road of 90 Stairs, along the wall of Jeil Church, served as a secrete passage to the rally point of an independence movement away from the Japanese police's surveillance, as it was covered by a pine forest. Currently, photos that vividly show the landscape of the city in the early 1900s, and the independence demonstrations, are displayed on the wall along the road. The Japanese authorities, who mercilessly cracked down on the protest, incarcerated many leaders of anti-Japan resistance movements at Seodaemun Prison in Seoul. Yu Gwan-sun from Cheonan was jailed in the first modern prison in Korea that Japan built. Transferred to an underground cell in the prison, she marked the first anniversary of the March 1 Movement before dying of her injuries on Sept. 28, 1920, at age 17. After a sharp increase in the number of inmates, the colonial authorities added facilities, expanding the space more than 30-fold, to 51,200 square meters in 1930 from 1,600 square meters in 1908. The prison had been used as a penal facility even after Korea's liberation from colonial rule in 1945. It became a national museum in 1988, one year after a new detention center was built in the city of Uiwang, just south of Seoul. 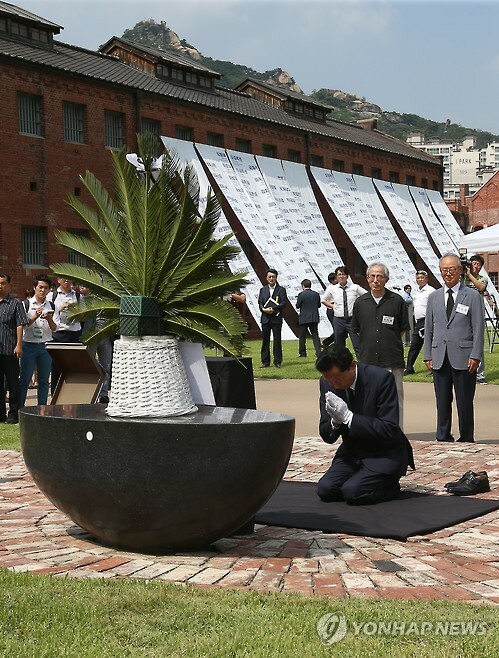 In August 2015, former Japanese Prime Minister Yukio Hatoyama visited the Seodaemun Prison History Hall and knelt down to observe a moment of silence before a monument to colonial-era independence activists.